Superior Court Judge David Lampe has ruled that a California baker has the right to discriminate against gay and lesbian couples seeking a wedding cake. The judge claimed that Tastries Bakery owner Cathy Miller’s First Amendment rights were infringed by the state’s civil rights laws forbidding discrimination by merchants serving the general public. Mireya and Eileen Rodriguez-Del Rio filed a complaint with the California Department of Fair Employment and Housing. Lawyers for the state brought the lawsuit against Miller. Lampe’s ruling, however, was only on a request for a preliminary injunction against the baker. The next hearing is set for June, but Miller’s lawyers have said they will seek to have the case dismissed based off the judge’s ruling. “The State cannot succeed on the facts presented as a matter of law. The right to freedom of speech under the First Amendment outweighs the State’s interest in ensuring a freely accessible marketplace,” Lampe wrote in his ruling. Miller’s attorneys argued that making a wedding cake is an artistic expression and the judge agreed. 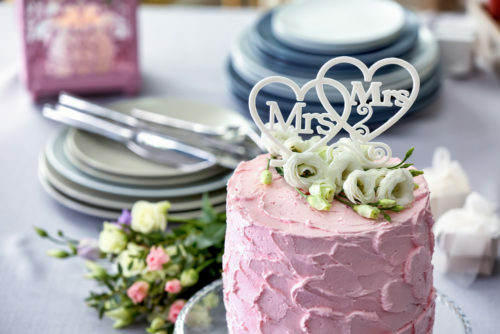 “A wedding cake is not just a cake in a Free Speech analysis. It is an artistic expression by the person making it that is to be used traditionally as a centerpiece in the celebration of a marriage,” Lampe wrote. The judge’s logic left observers scratching their heads as he tried to give some wiggle room for his decision, saying there was a difference between creating a wedding cake and selling a pre-made cake that would be used in a wedding. The baker’s website features a long list of example wedding cakes she has made for couples, but under the judge’s ruling a lesbian or gay couple would not be able to order one, despite the requirement under his logic for unique artistic expression because the baker would have to recreate it.